Nice Vacations are a sun drenched affair with white, pebbly beaches, and the sparkling blue waters of the French Rivera, known as the Cote d’Azur in France. Sunbathers rejoice, as Nice France is the place to lay back and soak. When bored of napping, people watching becomes a verified pastime, and there are plenty of buildings in town to explore. While Nice France gets a lot of press for its beaches and celebrity vacationers, the old city harbors baroque churches, stylish buildings, and art museums. Our Nice city guide starts at the modern art museum, which houses a collection of art from 1950 onward. Four towers holding the collection rise skyward with rooftop gardens. Glass bridges connect the towers from the inside, and look impressive from the outside. Continuing the Nice city guide, the Musee des Beaux-Arts, housed in a 19th century villa, features an original plaster of Auguste Rodin’s Le Baise (The Kiss). Also, the Villa Arson shows cutting-edge conceptual art. The Cathedrale Ste-Reparate, from the 17th century, has an 18th century bell tower, and a ceramic tile dome. Lascaris Palace was built in 1648, and features vaulted staircases, stone balustrade, coves filled with sculptures, and a wealth of paintings and furniture. Cours Salega is a famed street, with 18th century houses, plane trees, and a daily market. Last on the Nice city guide, the Chapelle de la Miséricorde is worth checking out for its half dome, cupolas, frescos, faux marble, and crystal chandeliers. Nice vacations are an excellent opportunity to check out the dynamic pedestrian walkway that parallels the promenade des Anglais. The walkway runs along the sunny waterfront where walkers, joggers, and inline skaters traverse beneath palm trees. Near the promenade, don’t miss the Albert I Garden. A multitude of flowers and palm trees grow here. Also near the promenade is an Italian style theater, home to the Opera de Nice. 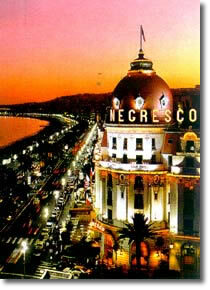 There are several hostels, mid-ranged hotels, and plusher, luxury accommodations in Nice. The glorious waterfront is lined with a nice selection of hotels, and more budget oriented accommodations are found inland. The Windsor is a stylish hotel with art centered rooms, and the Felix is a small hotel owned and serviced by a couple, with balconies over the rue Masséna. Nice France is blessed with sunny weather, charming French atmosphere, and plenty to see and do while on holiday.